Collective2 is the world’s largest open trading-strategy platform. If you are good trader, or have developed a good trading algorithm or trading method, you should publish your trades on C2. You choose how much to charge monthly for access to the trade signals from your strategy and then keep 50% of the monthly subscription. With over 100,000 registered users, and hundreds of millions of dollars of automated transactions flowing through our platform each week, Collective2 is the dominant trading strategy platform. 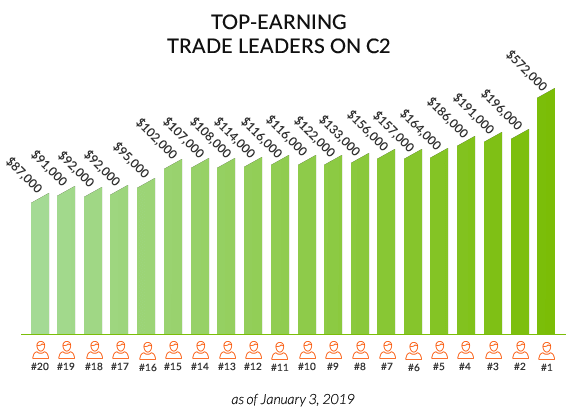 If your strategy performs well at C2, you will probably make money. How much? That obviously depends on your strategy, but we can give you some benchmarks. The highest-grossing strategy on C2 has earned over a half-million dollars. Other strategies approach the $100,000 dollars in revenue level. And quite a few good strategies cluster around the $50,000 to $75,000 level. Payouts represent the total payments made to the Trade Leader. How much does Collective2 cost for strategy managers? You can create a trading strategy for free. Use this period to try out all the features included on the platform. If you like us (we’re sure you will), then you can choose a Trade Leader plan to maintain your strategy on our site. Once you start signing up subscribers, we’ll take care of all the transaction processing. We charge a flat percentage for any subscriptions you collect through Collective2, but only if and when you collect subscription fees. This fee includes our credit card costs. Offer Autotrading to subscribers. Included. Broadcast signals via email, Instant Messenger, or cell phone. Included. Private forum for your subscribers. Included.